Welcome to the 9th week of JustRite Stampers’ Wednesday feature, 12 Weeks of Christmas Blog Hops! Every Wednesday up until Thanksgiving some of your favorite designers will be joining some of the JustRite design team for a series of Christmas blog hops, showcasing JustRite’s entire Christmas Collection of stamps! Don’t forget that JustRite has some Christmas stamps in their newly released CLING line of stamp sets, too -- you can find them HERE. This week, the designers joining the JustRite design team is the Just Us Girls (JUGS) challenge blog design team! For the month of November, we thought we would switch gears a little and throw in some holiday gift ideas using your JustRite stamps, so be watching for those, too, on November’s hops! And in celebration of JustRite’s 9th and 10th weeks of Christmas Blog Hops, they have a huge surprise for you -- take 25% off All JustRite Original Christmas Stamps now through November 15th, with free shipping within the U.S.. Don't forget to tell Santa!! I used a couple of the newly released Cling sets today. First, I paper-pieced the mittens (minus the sentiment) from CL-02025 Sparky and Friends - Cling. They are cut out using the smallest Spellbinders Nested Mittens die. The sentiment, "Merry Christmas, Dear Friend" is stamped on a small vellum panel which is stitched onto the long rectangle. The sentiment is from CL-02020 Sparky the Snowman - Cling. 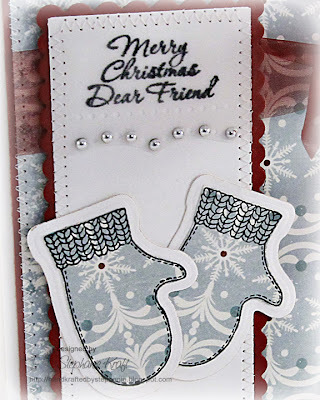 Dies & Punches: Spellbinders Classic Long Rectangle Nestabilities-LG (die 3), Classic Scalloped Long Rectangle Nestabilities-LG (die 3), Nested Mittens Shapeabilities (die 1), Martha Stewart Cherish border punch, Zutter Round-It-All. Accessories: May Arts sheer ribbon, Shiny silver pearls, Sunburst gem (Pizzazz Aplenty), Foam tape, Sewing machine and white thread. Darling card, Steph -- love those mittens! THUD - just beautiful - what a great color palette. Love it and the silver beads along the edge - perfecto! Sooo pretty!! I love the mittens. Gorgeous, love the paper pieced mittens. OMG, Stephanie, your card is so elegant and beautiful!!! Love the colors. So pretty! Love the bling! Oh so lovely! Love all the details you used and those mittens are adorable! Adorable card. The mittens are cute! Love the detail on your cards. Love the color palette. Gorgeous paper. Really shows off this adorable mittens. So pretty! I love the bling! Ohhhhh ! I wish I was your "dear friend" - this is STUNNING! Love everything about it, nicely balanced. I love the colours you have used, and those mittens are just sooo cute! Love the detail with the silver beads/pearls. And the big dimonte in the knot of the ribbon really finishes it off! !